Happy Savage is a Seattle band playing funked-up blues, rock, reggae, and world beat dance grooves, with jams that boldly go where no jam has gone before. 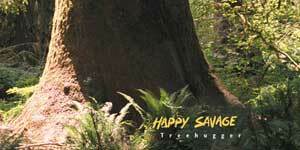 Happy Savage sings about peace, love, trees, human beings, and the end of the world as we know it. Hear Happy Savage with Grateful Dead keyboardist Tom Constanten, "Funky Treehugger"
"Treehugger", the first studio album from Happy Savage displays the bands musical versatility and the strength of their songwriting. Help save the wild bison of the Yellowstone area!